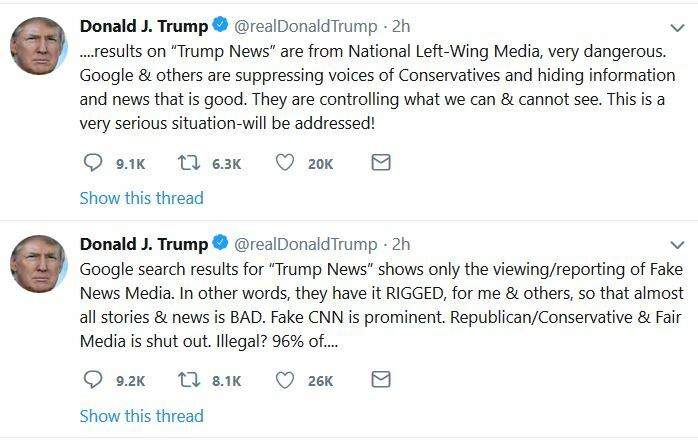 Yesterday, President Trump tweeted about the increasingly obvious conclusion that the major social media platforms are extremely Left Leaning and are censoring conservative voices and opinions on their sites. This reminded me of a study that the Media Research Center released mid-April of the year titled: CENSORED! How Online Media Companies Are Suppressing Conservative Speech authored by Ashley Rae Goldenberg and Dan Gainor. If you aren’t aware of whats going on, or you are ready to understand how bad things really are, please continue reading. Like it or not, social media is the communication form of the future — not just in the U.S., but worldwide. Just Facebook and Twitter have a combined reach of 1.8 billion people. More than two-thirds of all Americans (68 percent) use Facebook. YouTube is pushing out TV as the most popular place to watch videos. Google is the No. 1 search engine in both the U.S. and the world. Twitter Leads in Censorship: Project Veritas recently had caught Twitter staffers admitting on hidden camera that they had been censoring conservatives through a technique known as shadow banning, where users think their content is getting seen widely, but it’s not. The staffers had justified it by claiming the accounts had been automated if they had words such as “America” and “God.” In 2016, Twitter had attempted to manipulate election-related tweets using the hashtags “#PodestaEmails” and “#DNCLeak.” The site also restricts pro-life ads from Live Action and even Rep. Marsha Blackburn (R-Tenn.) but allows Planned Parenthood advertisements. Facebook’s Trending Feed Has Been Hiding Conservative Topics: A 2016 Gizmodo story had warned of Facebook’s bias. It had detailed claims by former employees that Facebook’s news curators had been instructed to hide conservative content from the “trending” section, which supposedly only features news users find compelling. Topics that had been blacklisted included Mitt Romney, the Conservative Political Action Conference (CPAC) and Rand Paul. On the other hand, the term “Black Lives Matter” had also been placed in the trending section even though it was not actually trending. Facebook had also banned at least one far-right European organization but had not released information on any specific statements made by the group that warranted the ban. Google Search Aids Democrats: Google and YouTube’s corporate chairman Eric Schmidt had assisted Hillary Clinton’s presidential campaign. The company’s search engine had deployed a similar bias in favor of Democrats. One study had found 2016 campaign searches were biased in favor of Hillary Clinton. Even the liberal website Slate had revealed the search engine’s results had favored both Clinton and Democratic candidates. Google also had fired engineer James Damore for criticizing the company’s “Ideological Echo Chamber.” The company had claimed he had been fired for “advancing harmful gender stereotypes in our workplace.” Damore is suing Google, saying it mistreats whites, males, and conservatives. Tech Firms Are Relying on Groups That Hate Conservatives: Top tech firms like Google, YouTube, and Twitter partner with leftist groups attempting to censor conservatives. These include the Southern Poverty Law Center (SPLC) and the Anti-Defamation League (ADL). Both groups claim to combat “hate,” but treat standard conservative beliefs in faith and family as examples of that hatred. George Soros-funded ProPublica is using information from both radical leftist organizations to attack conservative groups such as Jihad Watch and ACT for America, bullying PayPal and other services to shut down their funding sources. The SPLC’s “anti-LGBT” list had also been used to prevent organizations from partnering with AmazonSmile to raise funds. Avoid Partnering With Bad Actors: Twitter, YouTube, and others had tried to establish policies that prevent so-called hate speech on their platforms. But those policies are being enforced by organizations that spew hate against the conservative movement and can’t pretend to be neutral players. Groups like the SPLC and ADL label core conservative values as “hate” or “bigotry.” Tech companies can’t expect conservatives to trust a system that is so blatantly one-sided. Modify Flagging Systems: One of the worst problems tech companies grapple with is the abuse of their flagging and reporting systems. YouTube, Twitter, and Facebook, in particular, succumb to liberal activists who game their systems and constantly report conservative content. These services must determine a better way to handle alerts that do not allow coordinated campaigns against the right. If you’ve reached this point, I strongly urge you to click on the link below and read the full report. I am betting you will be as upset as I am about what is happening. While I am not a champion of government involvement, something needs to be done. This has nothing to do with Net Neutrality, which would not apply here, but rather a freedom of speech censorship issue. Additionally, in the video below Erik Wemple, Washington Post media report, interviews Sharyl Attkisson about her book The Smear: How Shady Political Operatives and Fake News Control What You See, What You Think, and How You Vote, in which she reports on how smear tactics are used to influence public opinion. Almost from the start, you can see that he doesn’t like what she is saying as he tries to trip her up whenever possible. But, she has a big surprise for him towards the end when she counters about him looking for dirt on her. This entry was posted in Fatherly Advice, Make America Great Again, NoBama, Rants and tagged Advice, MAGA, NoBama, Political Correctness, Politics, Progressive, Rants, Technology. Bookmark the permalink. ← What Grade Should Johnny Be In?